That is the way locals here associate to the floating market Five-Way Intersection in Soc Trang, intersection of five rivers: Ca Mau, Vinh Quoi, Long My, Thanh Tri and Phung Hiep. 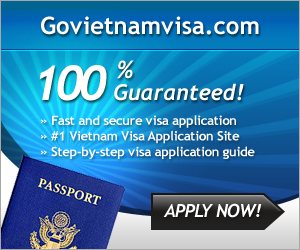 People have started concentrating here to purchase, gradually it has become a distinct activity in west of Southern Vietnam, that is the floating market Five- Way Intersection. Canoes and small boats carrying goods move on river one after another. All purchasing activities take place on canoes. If you want to sea busy market activities at the floating market, you have to come here on early morning. 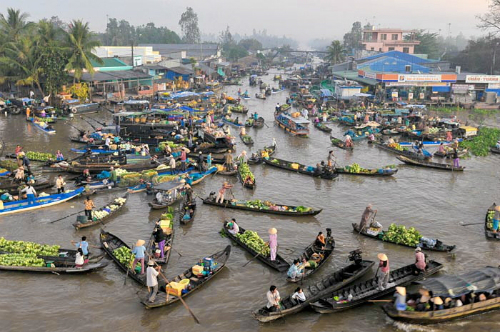 Unlike daily markets, they are usually in busiest time of morning or lunch; the floating market is busiest at 3 or 4 am. It is time that all boats gather to exchange goods with traders in nearby areas. With Vietnamese silk pajamas and conical leaf hats, women here smile to welcome traders visit and purchase their goods. There are a variety of goods selling on boats and canoes such as: rice, fruits, noodle broth, etc. 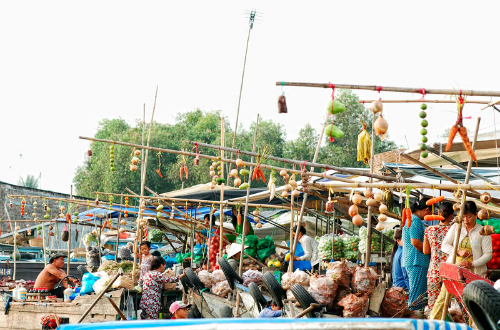 Another recognizable characteristic of the floating market is a hanging tree before each boat. So, when coming Nga Nam floating market, people still look for that hanging tree to find goods they want to purchase. 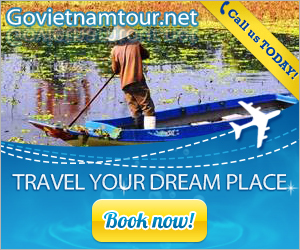 Therefore, the hanging tree is considered a “advertising tree” of the Nga Nam floating market in particular and Mekong Delta floating markets in general. Visiting the Nga Nam floating market, apart from drops of sweat rolling on salesmen’s foreheads, tourists can easily catch radiant faces whose hold money in hand when their goods are sold much. Once immersing in the atmosphere of Nga Nam floating market, enjoying a hot bowl of noodle soups on boats, and looking boats sailing back and forth, tourists suddenly find peace.